The third Ottorino puzzle for me this year, although the first Listener, the other two being Evs (unfinished works and Les Six/The Five being the themes there). His last Listener was in July last year, with its theme of Dorothy Parker’s poem Resumé. 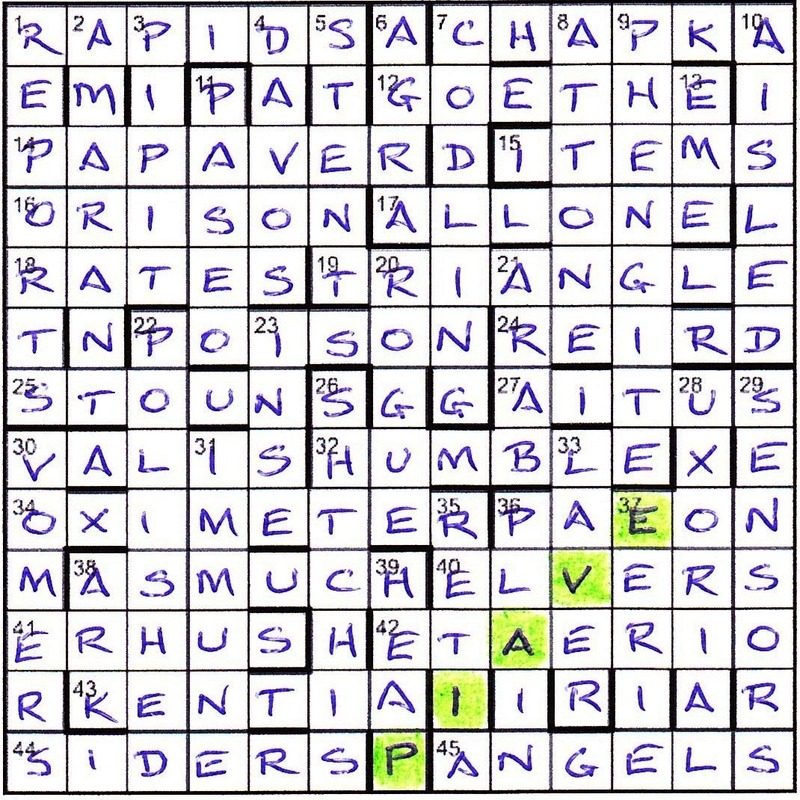 Here we had 24 clues requiring some sort of modification before solving. Eight required a set of consecutive letters to be replaced. Eight more required a similar replacement (or ‘exchange’ as the preamble stated) of just one letter. The remaining eight required a letter to be deleted from the clue, these spelling out a work involving plants. So that was 24 clues requiring modification out of a total of 51. Phew! Other words would need to be identified or changed in the final grid, but they would have to wait until I was finished. We were told that two of the first type of clue change involved the removal of a hyphen, so I was on the lookout for those as I decided to give the clues a quick run through. With 12 GOETHE, 14 POPADUM, 15 STEMS, 18 RATES and 25 STOUN being solved in the top of the grid fairly quickly, I felt I was on a roll, but that was it for the acrosses. 14 Piece one starts to deep-fry until made crisp (7) and 22 Say phone-in is doable after operator returns (6) with their pesky hyphens eluded me, unfortunately. Ravel appeared in the clues twice, so I was prepared for a musical theme. I came off slightly better with the downs, and after 30 minutes had a fair smattering of eighteen entries around the grid. Needless to say, the hyphenated 10 One-eyed, in places he is guided by the hand (6) wasn’t one of them. Perhaps if I’d listed the hyphenated words separately — deep-fried, phone-in, one-eyed — I might have guessed what was going on? Hmmm… no, that was unlikely! Back to the top of the grid, and 1ac Donees are American ones paid up in rupees (6) was obviously RAPIDS, but what did donees have to do with it? Mrs B came to the rescue. Under Rapid(ity), Rapidly, I found dalle, and Chambers defines it as “a rapid where a river runs in a gorge between steep rocks (US)”. So Donees became Dalles, all for one, and looking back at those hyphenated words, I could see we might have one for all — obviously not in deep-fried! …Ravel appeared in the down clues twice as well, once in the company of Bartok. finally, in 30ac, 43ac, 1dn, 7dn, 20dn, 21dn, 23dn & 39dn, one letter was dropped: be[v]y, pl[i]ant, p[o]ops, sing[l]es, rip[e], [t]one, [t]in, b[a]ulk, spelling out VIOLETTA. And so the last pieces of the jigsaw could be put in place. Alexandre DUMAS father, the author of The Three Musketeers, was the father of Alexandre Dumas SON, the author of The Lady of the Camellias. The book was adapted for the stage, and this inspired VERDI to compose the opera, La Traviata, with principal character Violetta Valéry. The final plants were revealed in the grid by changing another O to an A, giving PAPAVER and AMARANT at 14ac and 2dn respectively. The librettist for the opera was Francesco Maria PIAVE. Thanks to Ottorino for a not too difficult a week, and a rare romp for me into the world of the opera. What’s that? Oh yes, I’d forgotten La Donna è Mobile from Verdi’s Rigoletto a few week’s ago! This entry was posted on 9 October 2015 at 4:00 pm	and is filed under Solving Blogs. You can follow any responses to this entry through the RSS 2.0 feed. You can leave a response, or trackback from your own site.